Yet again, a lot has happened since my last update. I promised to give more timely updates and work steadily on my Buick over winter. Life happened though and, with finishing our basement, my wife's pregnancy and subsequent delivery of our second son, Case, work slowed to a stand-still. That all changed a few weeks ago when I was getting my lawnmower ready for the new mowing season. As I was changing the oil, my son, Pierce, was "working" underneath his electric tractor. At one point he stood up, walked over to the Buick and asked "Dad, are you EVER going to finish the Buick?!" I replied, "Yeah buddy, we'll have it on the road this summer." He sort of stepped back, gave me and the Buick a once-over, and as he turned away he mumbled "Well you better get a trunk on it." He's not even 5-yrs old! How did he get so sarcastic? I guess I'm teaching him something. The best reply I could come up with was "Well, it's called a deck lid!" I don't know if he meant to light a fire under me, but he did. That same afternoon I pulled out my deck lid, and its hardware. The hardware went into a cleaning solution while the deck lid was brought out for color sanding and weatherstripping. I was a bit dismayed to learn that mice had used my deck lid as a temporary home. Temporary I say, because the sign of their presence was all of the poison pellets they stored inside the lid's nooks and crannies. After the poison was cleaned out, color sanding began. I didn't have much orange peel on the lid so I started sanding with some 1200-grit paper. From there I moved to the wool buffer for a mirror finish. The weather strip I used on the lid was 1/2" x 3/4" and attached with what is essentially industrial rubber cement. The glue is placed in the lid channel and then on the weather strip. Both halves are allowed to dry, then a second, thin wet coat is applied and the halves are mated. The resulting bond is incredibly strong and it will be up to the next guy to figure out how to get all of that glue and strip off if necessary. With the basic lid complete, I carried it out to the garage and installed the lid hinges on to the lid. 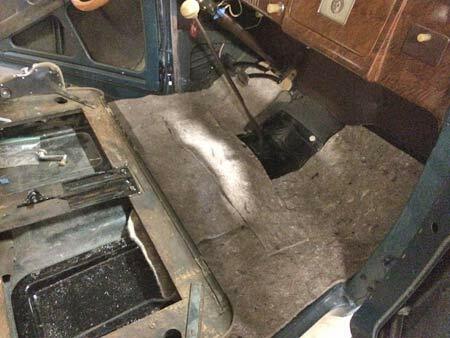 The wood inside the rear deck compartment was removed for replacement, but, best of all, it now created enough room for a small man to fit inside and work. Do you get where I'm going with this? Rather than try to hold the lid open while the hinges were attached to the coupe body, I crawled into the compartment and, with the help of my dad, set the lid in place with me inside. I turned a flashlight on in the coffin-like compartment and installed the hardware. In just a couple minutes I was able to secure everything and return to the living (and fresh air). The door handle and latch hardware was installed and that portion of the project was finished. Take that Pierce, the Buick now has a "trunk"! Since my dad was still on site, I then jumped inside the passenger compartment while he stayed outside. He applied some pressure to the windshield's rubber center divider while I installed the hardware and trim piece on the inside of the car. In theory, my car is now be watertight. A few days passed and I wanted to get back on the project so I went out to finish the passenger compartment floor. The original design featured particle board cutouts laid in depressions in the floor pans. 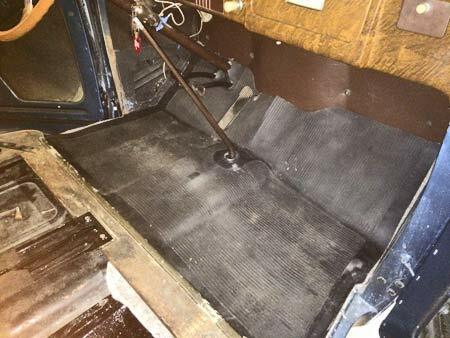 The floor was then covered in jute pad and topped with a front and rear rubber mat. To improve on this design I had originally wanted to use plywood and Dynamat. After investigating the price of Dynamat I decided to use a much cheaper alternative from Eastwood called X-Mat. Unfortunately, I waited too long to jump on this project so when it was finally time to order, I heard the cry of a newborn in the background and felt a little guilty buying expensive sound deadener when I should be saving for his college fund or, at least, diapers. The guilt trip drove me to use 1/4" plywood to fill the pan depressions and I topped it with a new jute pad for a total cost of $16.85. I then placed the rubber mats that I had already purchased in position and my floor was flat and soft. Down the road I may replace the jute with a fancier product. Access to the floor is so easy that it will make a nice project for a future winter. Measuring and cutting jute pad for the front compartment. Jute and rubber mat laid down for a trial fit. Now I was finally ready to install the headliner. You may remember from an earlier journal entry that I had replaced my original headliner 5 years ago and produced marginally acceptable results. That initial headliner replacement included lots of wrinkles and a small void near the rear window where I cut the hole too close to the opening. If there's one thing that everyone sees when they look into your car, it's the headliner, so I bit the bullet and bought a new one from LeBaron Bonney. I chalked it up as the price of an education. I also educated myself by re-reading Terry Boyce's 1981 edition of Car Interior Restoration and talking to a professional upholsterer at a recent AACA event. My roof before headliner installation. A few years back, headliners were really quite a mystery to me. They hang there, looking all perfect, never flexing or bending as the car moves. After a little investigation, however, their mysteries are revealed and you discover that it's really quite simple. The mystery (and beauty) relies on something called listing tape. This tape is about 1-1/2" wide. 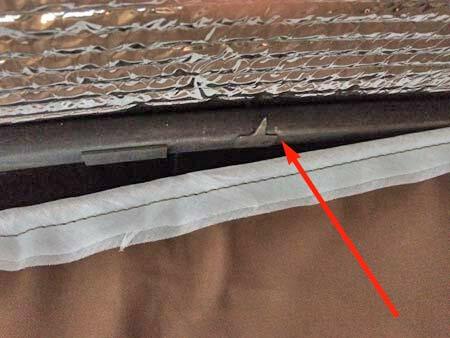 It is folded in half and sewn to the back of the headliner, resulting in a tube. Flexible metal rods (approximately 1/8" diameter), called listing rods, are inserted through the tube. On the underside of the roof, my car has a few dozen sharp tabs and points. It's on these tabs that you press the listing wire onto. When the tab punctures the cloth, you simply bend the tab up toward the roof and the wire and headliner are fixed into position. A close-up of one of the forward listing wire tabs. Tabs in the rear of the car were longer. Headliner installation. I used clothes pins to keep the headliner from dragging on the floor. I started at the first row of tabs closest to the rear window. I found my center mark and mounted the first tab. Then I worked my way left and right from center, PULLING SNUGLY toward the side of my car. This is absolutely critical for a tight headliner and my major mistake the first time I tried installing a headliner five years ago. That time I simply held the listing wires up and installed them. Since the tabs go through the listing tape, there's no way to make the headliner tighter after you mount the tab. After the first row, I worked my way forward toward the windshield. The style of tabs changed as I worked forward but the principle remained the same. 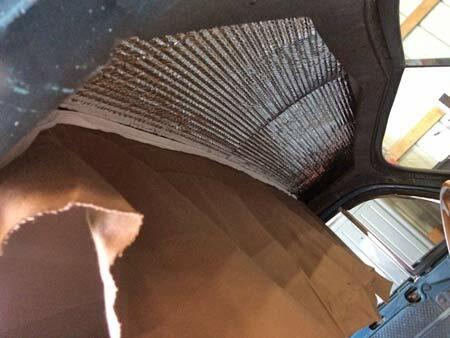 While the metal tabs handle the headliner in the center of the car, you need to tack or staple the sides of the headliner to tack strips mounted on the sides of the body. Here again you must pull the headliner snugly. I started in the front and worked my way rearward on each side. I used a pneumatic stapler instead of hammer-driven tacks and it allowed me to work quickly. Almost finished, no more listing wire tabs. The forward portion is tacked into strips above the windshield and concealed by the windshield trim. At this point I was tacking the edges of the headliner to the tack strips. 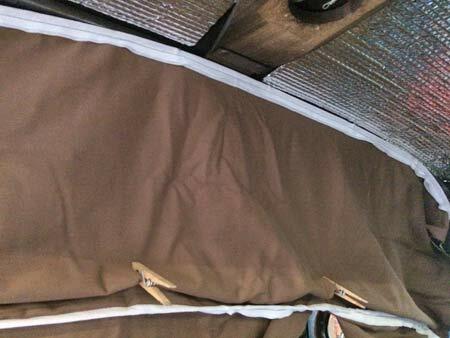 Note that the rearward portion of the headliner is loose and wrinkled. After tacking, the extra material is cut off and concealed by windlace AND wire-on. The rear edge of the headliner is tacked to the back board. 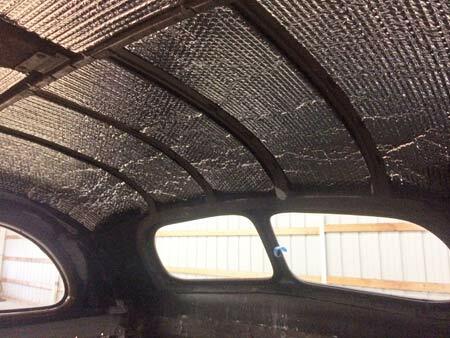 From here the headliner is tacked to the lower edge of the rear window relief and the trim is installed. Then the cloth is cut from the opening. Finally, I secured the rear window molding in place and then cut the hole in the headliner. The first time I installed the headliner I cut the hole before installation. That is why I had poor results the first time. 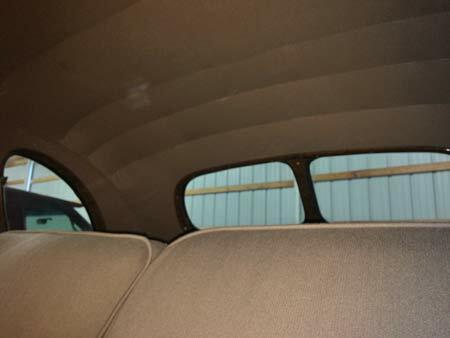 This time, however, the headliner around the rear window is tight and complete. To hide your side tack strips and finish the presentation, you need to install wire-on and windlace. The windlace is trim but the wire-on is what makes a job look finished. This is accomplished by placing the windlace in position and then putting wire-on on top. A nail or staple is then installed and you do this until your entire strip is complete. As the name implies, wire-on has flexible wire inside of it. After its installation, you come back and fold the wire-on, using half of the wire-on to conceal your tacks or staples. I am very proud of my headliner installation. There are many portions of my Buick where I can say "Well I could have improved this or that." But the headliner is one of the few that I can say "I did that perfectly." 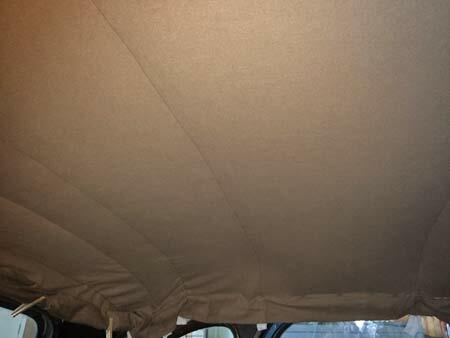 For me, it was absolutely worth the money for a second headliner to do the job right. 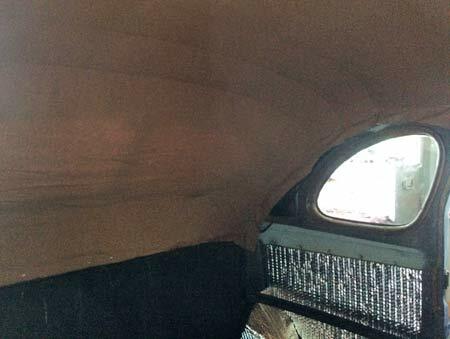 The interior quarter panels, dome light, sun visors and rear-view window were then installed, followed by the seats. Door panels will be installed in the future so, for now, the interior of my car is complete. 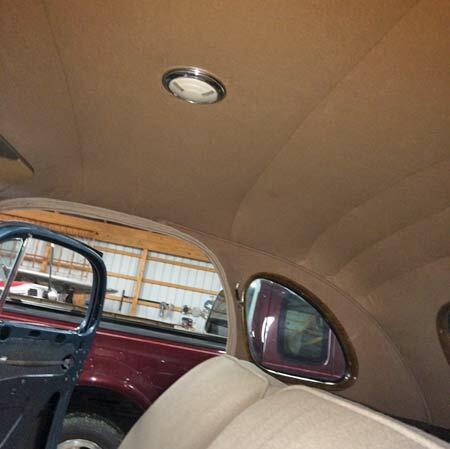 Side view shows the dome light, rear quarter and edge of unrestored sun visor. I will point out that I did not restore my interior deck lid hardware, rearview mirror or sun visors and this was intentional. When I got my car, aside from the exterior paint, everything else was original and unmodified from the day it left the factory. I felt a little guilty about deleting all of the car's history so that is why I kept a few little pieces 100% original. All of these pieces are easily accessible, so, if I really want to change them in the future, it's only a matter of removing a few screws. It appears that I really am on the homestretch with my car. I'm sure after it's on the road there will be dozens of small projects and adjustments, but all of the big stuff will be completed very soon. The only major portions that remain include the front and rear fenders and the hood and grille. My family seems to have found its new normal so my time to work on the Buick is now clear. My next journal article will be my last and as I look back on 5-years of progress photos I can't believe how far the project has come. My overriding thought while looking at those pictures is how naïve I was. Maybe naiveté is the best tool to tackle a job like this.